6 Materials For Your Kitchen Countertops | BVK Ltd.
Kitchens are one of the most important spaces in a home, and choosing the right kitchen countertops for that space can truly make a difference in how a kitchen looks, feels, and how well it holds up to daily use. The following is a guide to the 6 most popular materials for your kitchen countertops to help you narrow down your search. Solid surfacing materials are typically made either with 100% acrylic or polyester or a combination of the two. Solid surface materials are beneficial because they are stain and scratch resistance and can be easily repaired no matter what type of damage occurs. Solid surface materials come in a plethora of colors and designs and can even come in composite styles that create imitation stone looks. Plastic laminate is the perfect choice for a tough kitchen because it’s made from incredibly durable material that is best known today as Formica. Plastic laminate can be made with dozens of patterns, hundreds of colors, and a wide array of textures to create the perfect look and feel for any kitchen. 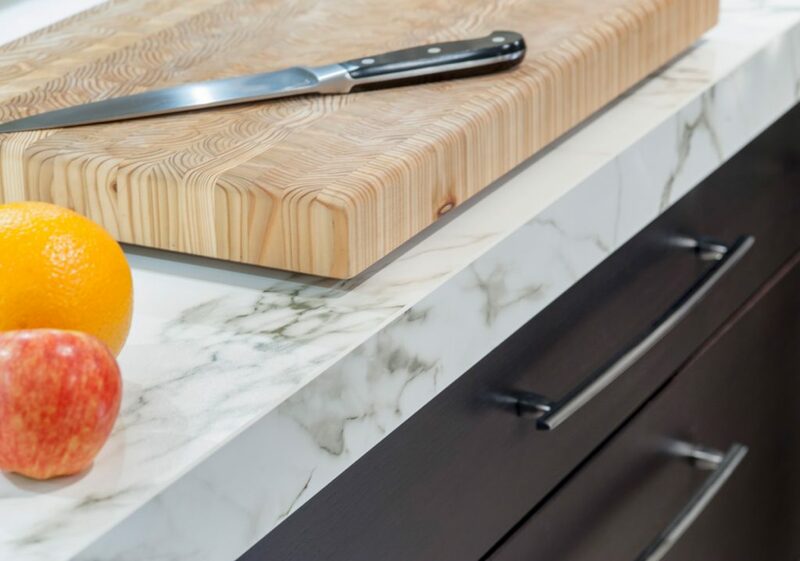 Natural stone materials are an incredibly popular choice for kitchen countertops, and for good reason: they look great, feel great and, when used properly, can be a durable choice for regular kitchen use. The most common natural stones used for modern kitchen countertops are slate, granite, and soapstone. Granite was once reserved for expensive kitchens, but it is much more affordable today. Granite countertops are treated with a special sealer that makes the granite stain resistant for at least 10-15 years and needs to be cleaned using a stone cleaner to ensure the granite isn’t damaged during that time. Soapstone is a porous material and has to be sealed heavily with mineral oils to reduce chances of staining, while slate is much more easy maintenance due to not being a porous material. Slate, however, does have the disadvantage of being a soft stone, which makes it more prone to scratches which must be buffed away. Ceramic tile was once the most popular kitchen countertop material, but its popularity as a counter material has faded because it can be somewhat high maintenance and is less durable than other materials. Today, ceramic tile is most popular in backsplashes or secondary surfaces, rather than the most-used standard counters. Concrete counters have been rising in popularity in recent years as new developments in concrete counter design have made it more affordable and more attractive than previous types of concrete counters. Concrete kitchen countertops can now be delivered precast, rather than as poured concrete, which means they can be sealed right away. Wood was once an incredibly popular kitchen counter material that, like ceramic tiles, is no longer very common in standard kitchen counters. This is primarily due to the maintenance that wood requires, which needs to be oiled every few weeks to ensure a glossy shine. As with ceramic tiles, wood is now more popular for using in backsplash or secondary kitchen counters due to the higher maintenance that comes with using wood for the primary countertop in the kitchen space. 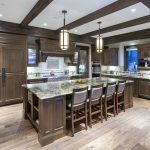 If you are in the process of looking for a luxury kitchen designer and/or business to handle the task of building your dream kitchen, be sure to contact Bow Valley Kitchens today, or stop in to one of our beautiful showrooms located in Calgary and Canmore, AB to start the process.